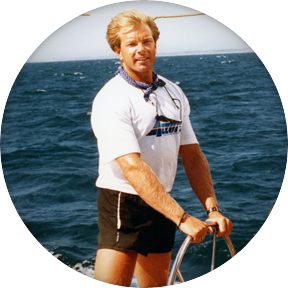 Bruce Merit is the owner/skipper of Sails Call and had a lifestyle consulting business for over 30 years and travelled to close to 50 countries. He brings all his worldly knowledge together here in his sailing charter business. A snapshot of his bio includes Bruce personally trained over 500 individuals including some of Hollywood’s A-list celebrities (Jody Foster, Nicholas Cage, Sylvester Stallone and others). Bruce was one of only 30 Polar Master Trainers in the world and created Polar’s Cardio Coaching program which is now used in hundreds of clubs all over North America. He created his own exercise Body Bar which is in over 400 health clubs in Japan and all over Asia. He was a massage therapist on the QE2 cruise ship, a CSA ski instructor up Grouse Mountain, a CYA sailing instructor on Deer Lake and a first class firefighter for Burnaby Fire Department. He is well qualified with over 45 years of sailing experience including crewing on a 75 foot sailboat during the America’s Cup in Perth Australia. Now he adds sailing adventures to his list of activities. He has his S.V.O. P. (Small Vessel Operation Proficiency), MED A3 (Marine Safety), ASA Levels 101 &103, P.C.O.C. (Pleasure Craft Operators Card), First Aid, First Responder and CPR. 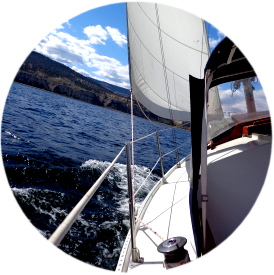 Spend a few hours experiencing the beauty and tranquility of Okanagan Lake with Bruce and you can forget your big city stress and have the experience of a life time! Sails Call is calling you!